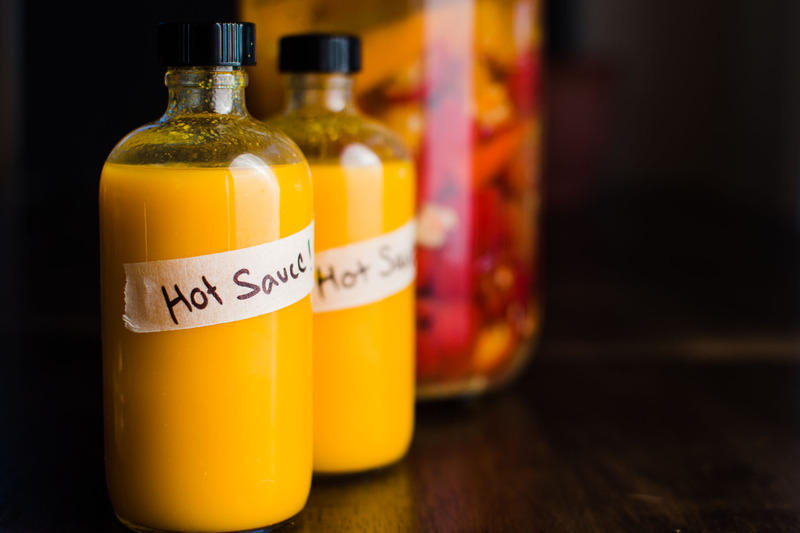 Fermented hot sauce, fiery and explosive with flavor, is fun to make in the late summer and early autumn when gardens and farmers markets are brimming with jalapenos, cayenne peppers, serranos and other chilies. 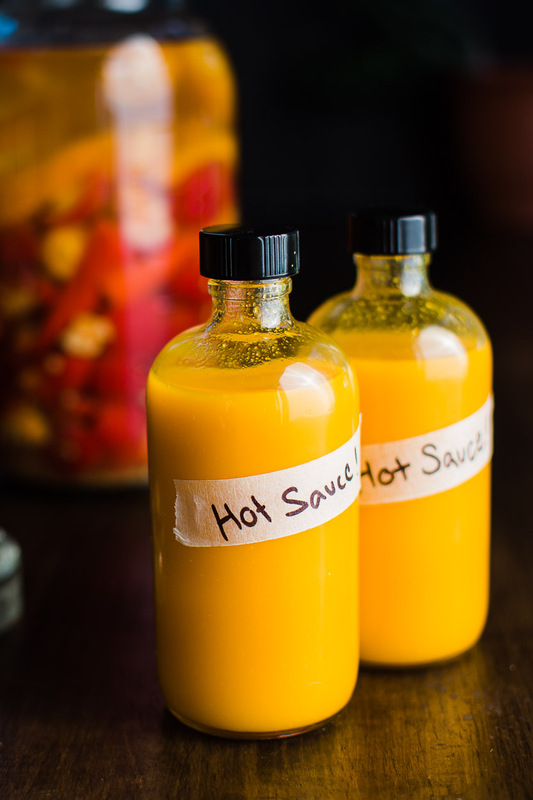 Fermented hot sauces are easy to make, and don’t take much active time in the kitchen beyond tossing a few hot peppers into a jar, waiting, and then blending them up to make hot sauce. Traditionally, all hot chili sauces were prepared through fermentation – and many of the world’s most renowned and well-loved sauces are still prepared through this time-honored technique of combining hot chilies with salt and allowing them to sit in vats and ferment. Both Tabasco sauce and sriracha are traditionally prepared through lactic acid fermentation, before they undergo further processing. 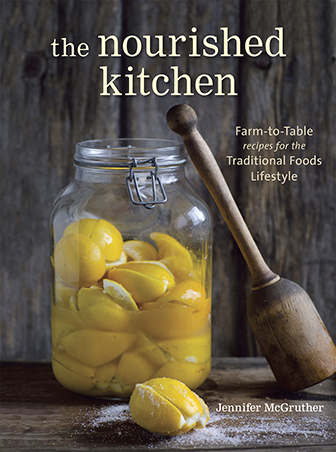 Fermentation is a magical and transformative culinary technique that not only helps to preserve foods that might otherwise spoil, but it also gives foods a complex and rich depth of flavor. It’s the beneficial bacteria that proliferate during the lengthy fermentation process that gives this hot sauce its unique and vibrant flavor. Any hot pepper will work in this recipe for fermented hot sauce. The heat of the pepper will influence the heat level of the final sauce. Blending two or more pepper varieties adds nuance, flavor and can balance the heat of single varietal hot sauces. Choosing a single variety of chili pepper at uniform ripeness, and color, can be fun, too, because it will result in bright and vividly colored hot sauce. Cayenne peppers work well, as do Scotch Bonnets, jalapenos, serranos, poblano, Fresno and cherry bomb peppers. If you need to temper the heat of the peppers, you can always add a few sweet peppers, like Bell peppers, to the jar, too. To prepare a good fermented hot sauce, you need just three simple ingredients: chilies, salt and time; however, the addition of garlic provides the sauce with depth and balance. You can also add other flavorings including herbs, spices, ginger, onion, scallions or sugar, which can temper the heat of the sauce. Chili peppers, like other vegetables, are prone to contamination by mold if they aren’t fermented under optimal conditions. You don’t want to spend the time and expense of fermenting hot sauce only to have it not turn out, so ferment the chilies in an airtight container. Optimally, that container will allow the carbon dioxide that builds up during fermentation to escape without letting oxygen, which can foster the growth of mold, in. A mason jar with a tight airlocked lid is both optimal and affordable. Keep in mind that chili peppers, like cucumbers, are prone to the formation of Kahm yeast, a benign yeast with a dusty white appearance. Kahm is often confused for mold, but, unlike mold, it never takes a fuzzy appearance and typically appears like a thin and dusty film on surface of the fermenting chilies. It also lacks any aroma, while mold will typically smell acrid. Keeping your ferments in a tightly sealed jar, fitted with an airlock, will help to prevent the formation of mold. Fermented hot sauce is a living food. It is rich in food enzymes and in beneficial bacteria. Once you puree the chilies and bottle your sauce, it will continue to ferment. Storing your fermented hot sauce in the refrigerator will help slow down the fermentation process; alternatively, you can can the hot sauce and it will become shelf-stable, but any probiotics created during fermentation will be destroyed. Seasoned with fresh garlic this fermented hot chili sauce is rich with flavor, bright and fiery. Use it in to add flavor and heat to your meals. Remove the tops from the peppers, and split them in half lengthwise. Pack a quart-sized mason jar tightly with the peppers, leaving about 1-inch headspace. Drop in the cloves of garlic. Whisk the salt into the warm water until it dissolves. Pour the brine over the chiles and garlic. Place a weight over the chiles and garlic so they remain submerged beneath the brine. Seal the jar tightly with an airlocked lid, and allow the chiles to ferment at room temperature 2 to 3 weeks, or until they smell and taste pleasantly sour. Strain the brine and reserve it. Transfer the chiles to a high-speed blender. Add 1 cup of the reserved brine to the blender, and process until smooth. Strain the pulp through a fine-mesh sieve, and bottle. Use right away or store in the refrigerator up to 1 year. For a thicker consistency, skip straining the sauce and bottle it as a puree. In addition to garlic, you can also add, onion, lime, turmeric, ginger or other herbs and spices. In addition to making homemade fermented hot sauce, you can make loads of other fermented foods easily at home. Hot Pink Jalapeno Garlic Sauerkraut is a fun take on sauerkraut and uses red cabbage, jalapeno peppers and fresh garlic. Easy Kimchi can be made with cabbage, chili peppers, radish and other ingredients. Daikon Radish Kimchi is a similar recipe made with daikon radish, ginger, garlic, scallions and Korean chili powder. Brine-Pickled Pepperoncini and Brine-Pickled Jalapenos are both easy to make and very similar to this recipe for fermented hot sauce. Hi! Can I ferment this like I do sauerkraut without the starter? Just salt and some sugar? I always ferment peppers without a starter. Never had an issue. They taste incredible. same question, is the starter necessary? Bummer … I didn’t see Erin’s question until now. I find it works better with a starter, but you should be able to increase the salt and still ferment it without a starter. Hi Jenny, when you starter culture, how much should be used? A whole packet? My rule of thumb is 1/2 packet per quart, but I’ve never fermented peppers before…. Shred a little cabbage or green onion into a jar, add a little kosher or sea salt, and as the vegetable sweats, tamp it down so it’s underneath the liquid. Let this sit at room temperature for a couple of days. Then, it should taste sour, and you’ve got your starter. Just put a little bit of the vegetable into the blender with the chilis and salt. You should not use yeast as a starter; these are lacto-fermented peppers so no yeast! I used a commercial yogurt starter (burglarious, acidophilus, thermophilus) with cayenne peppers and fermented them for seven days. I had to ferment it outside (warm days/cool nights) The color, texture and flavor out of the gate were marvelous, sadly it has a lingering bitter aftertaste that is off-putting to the point where I may just trash the whole thing. Does anyone have any clue what went wrong? Maybe I should have left it inside for a more even fermenting temp or did I use the wrong culture? Maybe I should have let it ferment longer?? Thanks! Did you have any white mold? If so did you pick it out or simply stir it back in? I have known the sauce to have an off putting after taste if white mold is stirred back in instead of picked out. Karen, I haven’t made this recipe but am very familiar with all kinds of salsas and chilis because they are grown where I am in far west Texas. Chilis can be combined in whatever way you prefer according to your taste or if you want a color mix. It’s trial and error as far as your taste, but there aren’t any rules as far as I know. Try some individual chilis raw (careful!) for an idea as to their taste, and then have at it! I have never fermented chilis but when fresh are great with onion, pineapple, apples, mangos, or pears, and I would love to try fermenting some of those combinations if it can be done successfully. Sometimes I strain and sometimes I don’t. It’s fantastic either way. Can the starter be made from the Sour Kraut Juice.? Absolutely! Any probiotic liquid (except kombucha/water kefir which can turn veggie ferments slimy) will work. Please tell me more about this. I don’t use dairy so I only have water kefir. So far my pickles turned out nice, but my cabbage (kraut) did not. I have whole pickled peppers in now with a little bit of water kefir grains. SHould I find a different way of doing this? Leave out the kefir. Your cabbage is teaming with good bacteria, so completely unnecessary to use any starter at all. Try making it with just salt and cabbage. I make a ton of fermented veggies without starters. I used to use whey, but always hated the flavor and the sliminess that surrounded the veggies. Once I realized it was unnecessary, I started using a vegetable starter or juice from sauerkraut when rushing a ferment. But usually, I just let them ferment themselves using a salt water brine. That always has the best flavor. Dairy bacteria is completely different from vegetable bacteria. They just don’t work well together for my taste buds. I went from ferment hater to ferment lover! Hi, I want to try this with our long green chilis that are fresh in the stores now in El Paso. Where do I find starter? I also want to know if I can add pineapple, onion, and/or other fruit to ferment the sauce successfully. Combined fresh, it’s fantastic but don’t know how it would work by your process. I grew up making all kind of homemade pickles and saurkraut, but this on is new to me. Thank you-can’t wait to try it! This looks so good. I love really hot foods. Do you have to strain and discard the solids or can you use as is? A few of my favorite (non-fermented) hot sauces still have the chili solids in them and I would love to use them. Here is the URL for the fermented foods section from the National Center for Home Food Preservation at the University of Georgia. if you can’t find the answer here, you could contact them directly. Hi Bob, I am recently made redundant and have been thinking of following a similar path to your self. With a view to growing larger crops of chillis and making pickles/ sauces/ pastes? and dried chillies to sell. I was hoping we may start an e mail exchange to chat about how it is going/ tips, ideas, pit falls. I love growing my own and need a money project too! How would you use Milk Kefir? I make Kefir from Raw Milk several times a week.. Thanks in advance!!! If you let the milk kefir sit long enough it turns into curds and whey (the yellowish liquid) you can then use the whey as the starter. How much of the sour kraut juice would you use as a starter,would it be 1/4 cup? You wouldn’t have to dissolve that in water, that’s only if using a starter, right? What do you use the strained peppers for? I hate to waste. Depending on their taste, saltiness, e.g., you could throw them in with some queso for a really zippy sauce, or you could mix it into cornbread, or into masa for a spicy tamale wrapper. All depends on if it’s something you’d want to eat. I’ve never tried this, so I’m guessing, but would it have enough zing left to infuse some vinegar for a hot vinegar condiment? All depends on how it tastes. By “covered” do you mean with the lid on the mason jar, or simply covering the mason jar with a cloth? i followed the recipe with a lot of hot peppers from a local farm (they were looking underpicked) and my sauce keeps bubbling out of the mason jar. i put on a metal top, and it stayed pretty leak free for 2 days, but today i opened it, and my hot sauce bubbled out like a spicy volcano. i still have another day or two to let it ferment, but was curious about this whole exploding pepper issue…..
i’d love to make more, should i not be sealing the top? MamaCassi, how far from the top did you fill your jar? You should leave atleast 1 inch if not 2 when fermenting like this. When lacto-frementing, from my experience, you don’t to ‘seal’ it with a lid. You should only cover it with something like cheese cloth to keep out bugs, dust, etc. Putting a lid on it will not let the gas that is created during the fermenting process escape. This could potentially cause the jar to explode and create a mess. My peppers got moldy after a few days. Can I scrape the mold off and still use the sauce? Help! I made this sauce, and added a bit of whey ontop of the sauce to ferment (like you say to do with the ketchup) and a big white fluffy cloud of mold has grown on it. Is it saveable? Is it food poisoning? Did it get too hot (too close to the crockpot)? Just curious why the green tops (but not stems) are included? Does this add additional flavor or provide a different use? Looks awesome! Just starting to get into growing peppers and making sauce now. I never let the milk kefir separate I just added the 1/4 cup of milk kefir! Oops! I assume its ruined???? My pepper mash has got white fury mold growing on it after a few days. Can I scrape the mold off and still use the sauce? hi guys was wondering does anyone know how to make Chipolte pepper sauce like the Tobasco style?? I love the smokey flavor of it and would love to make my own but a bit hotter!! how do you get smoked peppers to ferment. To any advice thanks in advance!! 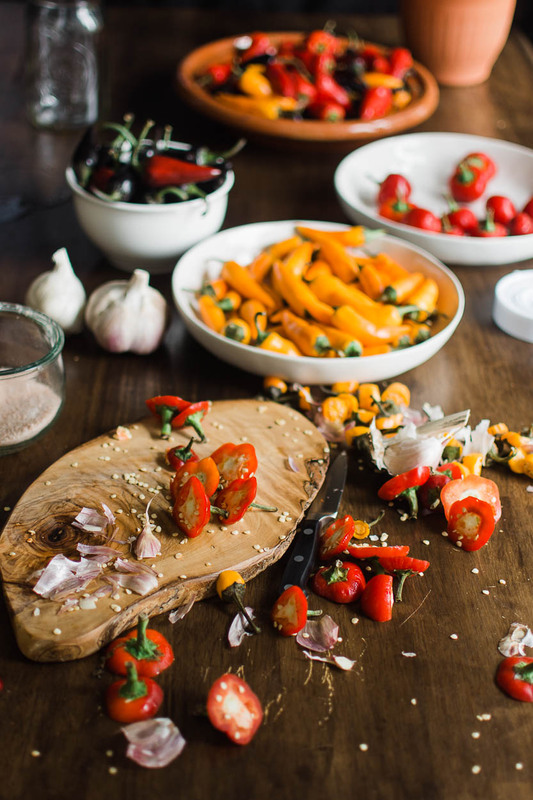 Thanks for posting this recipe – I’ve been looking for a way to make a fermented chilli sauce for a while and this seems a nice easy recipe! One small query though – you say to cover the mason jar, but I was wondering if I still need to allow air to get to it (ie; cover with a cloth) or do I simply put the lid on? Thanks in anticipation of your reply and keep up the good work! A very important thing you must know is that you are aiming for an lactic fermentation. This must be done by lactic acid bacterias that require an environment reduced or deprived of oxygen to grow as such. Most of the molds and fungi grow is oxygen driven so try to keep oxygen out of the equation. A neat trick is to close the jar and have a flexible tube allowing some the excess CO2 leaving the system into a glass of water. lassto search for it on YouTube. This prevents the oxygen to enter the jar. No. Your information is inaccurate. Lactobacillus bacteria are NOT obligate anaerobes; that is, they can grow and proliferate in both oxygen-rich and anaerobic environments. The reason most people prefer to use an airlock is that an anaerobic environment prevents the growth of other microorganisms (like mold) which may contaminate the surface of the ferment. I’ll try to find more info of the topic and get back to you as soon as I can. Just wanted to tell you I have been experimenting with this recipe. Everything went great. As I told you before, I used a couple of marmalade jars and a flexible straw to make the gases leave the system without letting any oxygen in. Hi, I’m just wondering too along with a few others who have asked the question already, do the solids need to be drained out? I like the heat in the chilli seeds. Have you ever tried “Cultured” chili paste? (Cultured Pickle Shop in Berkeley) I’ve tried for years to even compete with that divine elixer at home, and have not even come close. She uses a combo of chilis, her amazing cultured brines, and garlic, ginger and salt. Ri.dic.u.lous!! We truly go through pints of it monthly. I will try my hand at your recipe and see if I can make an elixer that compares. The nice thing is that she has a great supply all year long and I just can’t store enough to last that long. Just finished my sauce and it is wonderful! I used dried thin-walled red chilis and added quite a bit of extra water to hydrate it properly. I also mashed it up twice in the food processor to help with the hydration. My starter was sauerkraut brine. Because I had so little liquid in mine, I decided to put it through my oscar juicer in the end it turned out as a beautiful rich thick sauce – a bit like thin tomato puree. Tastes devine! no mold developed at any time – I just opened the jar and stirred the contents every day or so for 7 days. Thank you Jenny for this great recipe! no need to strain the solids if you don’t want to. Do you need to stir this recipe? The sauce appears to be separating after a few days. I didn’t see a reply to mold. It’s been ten days and it is not bubbly and has little bits of whitish grey mold on the peppers that are clinging to the side. Is this okay? Just sharing a tip on how to help keep the mold out of fermented foods. Place a plastic bag on top of the veges – whatever you are fermenting (I use two one inside the other, in case of leaks) then fill the plastic bag up with water. The bag will expand to fill the space and weigh down the vegetables so that they are always covered by brine. Never a trace of mold. We’re a bit addicted to hot sauce in my family. I’ve never tried making it myself, but I am very intrigued by your recipe. I can’t wait for chili peppers to start appearing at the farmer’s market! My husband says the hottest pepper is no longer the Ghost but the Trinidad Scorpion Butch T. I looked it up and this one now has been passed in heat by the Carolina Reaper. See http://en.m.wikipedia.org/wiki/Trinidad_Scorpion_Butch_T_pepper. Hmmm I wonder how hot they can get! I’ve made lacto-fermented chili-garlic paste before but haven’t ever strained out the solids or added a little sweetenery to make it more like sriracha. Looking forward to trying it! A few carrot coins can also provide sugar. Not to mention flavor complexity. Would it be possible to roast the peppers a little first so that the blackened skin would give a little smoky taste? Or do they have to be completely raw starting out? Can you also keep the paste-part, for curries, and such? IMPORTANT!!!!!!!!!!!!!!!! When you blend the peppers, DO IT OUTSIDE!! The fumes are so bad you can not breathe!!!!! Yum! I have been making fermented chili sauce for awhile now. It is delicious. I made a serano chili sauce that would knock your socks off. I like to put carrots in my sauce like they do in South America. It is really nice. Then you don’t need to use sugar. The sauce mellows with age but keeps the heat. we do something very similar every year. never used a starter and it ferments just fine. after a few weeks we move the jar to the fridge and let it ferment for at least 6 more months in there even better to wait a year then we run it through a blender and mix with some lime. yummy. the extra time aging in the fridge is so worth it. So I ended up with 2 quarts of the pepper mash, is this about right? Doesn’t 1/4 cup whey seem like very little starter for this amount of veg? I’m quite new to fermenting, just want to make sure I got the proportions right!! Any advice would be much appreciated. Thanks! Im unsure at the moment what bottles to use for my sauce. Its been fermenting for about 4 weeks now. Bubbling ceased about 3 days ago so im gonna need to bottle soon. I was actually thinking of buying a couple of vinegar bottles with the lids that restrict flow but im cluesless as to sterilization methods. I actually bought some brucleanse sterilizer usually used for homebrew, I used this to sterilize my fermenting vessels (I used some bbq sauce bottles that were the right size to use a bung and airlock with). I assume I could use this again to sterilize my bottles and lids? Or should I boil the bottles and soak the lids in sterilizer? Also Ive seen another recipe that actually calls for discarding the brine completely then blending the mash with vinegar in a food processor. I kinda like the sound of that. Anyone had any experience doing that? This was terrific. I didn’t have whey on hand so I used some ginger bug and a splash of juice from my last batch of kimchi. I didn’t separate it…. I left it as a chow chow or hot relish. I was really happy with the results. Ill always have a jar of this on the door in my fridge. Thank you very much! Very spicy. Very very very flavorful. I am so excited. We are making our own hot sauce! Ours also made 2 quarts. I am sure that it was enough whey. If not, it will just take longer. Can’t wait! In China we always ferment our peppers for making hot sauce to cook with. 10 pounds hot peppers, 1 pound garlic, crushed; 1 pound ginger grated; 3/4 pound salt, 1 pound white licor, like vodka. We make this once a year when peppers are ripe in about August-September, and it keeps all year. Just remember to keep water in the lip. The Chinese do not strain out the pepper mash, but leave it and use this to stir fry. Oh, I live in Guizhou Province where everything is HOT. I really want to prepare this but I’m a bit intimidated. I hope I do it ok.
As someone else mentioned, ghost peppers have not been the hottest pepper in the world for quite a long time. It was surpassed by the Trinidad Scorpion Butch T in 2011, which was in turn beaten by the Trinidad Moruga Scorpion in 2012, then the Carolina Reaper in 2013. How much Milk Kefir do I add? I made this with 1 Trinidad scorpion and about a million Chile Pequins and a few cloves of garlic. It is absolutely amazing I was just wondering if there would be a recommended way to thicken the sauce since straining it took all the body away (with those seeds in it I probably couldn’t eat it anyway). Can’t wait for my peppers to ripen to try this. Thinking of using a tbsp or so of honey from our hives to sweeten. Would that work or should I stick to sucrose or fructose? As for the white mold it is normally geotricum candidum, sometimes some penicillium candidum too. I grow those purposely on homemade goat cheese. So long as my sauerkraut ferment progresses OK I just scrape off the mold and any discolored kraut and save the rest of the batch. I’ve never had a problem doing that (nor did Busia, my Polish Grandma). I suppose it would be fine to do the same with fermenting pepper paste. Can I substitute the starter culture with apple cider vinegar? No. It would be better to leave it entirely out if that’s the case. Found some gorgeous chilies at the farmers market today and I can’t wait to try this! I’m a bit of a hot sauce junkie. Thanks for the recipe! Thanks you for the recipe and the detailed comments. I am fond of chili sauces and my favorite is the classic Tabasco. But I can’t get my chilies to ferment. First batch didn’t do anything and juiced very little (habaneros, jalapenos and Baccatums). I added little water and 1/20 of salt. Nothing happened. I had to add a lot of vinegar to press out a sauce. Another question: My first batch didn’t ferment, so it lacks depth in the taste, but it’s hot and good. When you add vinegar to the final product, how come Tabasco has a mostly homogeneous sauce. I mean it’s homogeneous eventhough it has to be shaken. My sauce after 2 days resting , the top part of the flask is only vinegar! It’s simple physics, but how come this doesn’t happen why Tabasco? I use a very small amount of xanthan gum in my hot sauces. It thickens it and prevents separation. I highly recommend it. I made this recipe recently and it was absolutely lovely, spicy and hot yet fruity. It will be a staple not in our place. Your book by the way is fantastic and is getting well read and shared around as people eat food from it I make. I was wondering if I could reuse the pulp to do another hot sauce ferment? I didn’t yield as much as I wanted & have so much pulp left that is still very hot. I used dried chilis for my hotsauce and the paste is really thick. Should I add water or will it be fine for fermentation? Don’t see activity after 12 hours. You mentioned using tomatillos along with jalapenos in your sauce. I currently have an abundance of both and would love to know how much tomatillo you use, and if your ferment them along with the peppers, or add them after? Won’t the sugar be metabolized by the lactobacilli? I have found when I ferment apples or other sweet fruits with vegetables they loose their sweetness. Thoughts? The leftover paste, can it be used like a paste or should it be discarded? Mine also went moldy, I didn’t see a reply to the mold question. It was just a small amount of white mold, is it garbage now? I scraped the mold off the top but I’ve read that it doesn’t matter if you get rid of what you see on top, there will be invisible mold through out the rest. I don’t want to toss it if I don’t absolutely have to though. Could this be done in a jar with an airlock or is an arobic environment required? I made this today and I wanted to know if there is any particular reason for straining the finished product. Is it just a personal texture preference or does straining help to preserve the food. I have read that garlic can be tricky and go rancid so I thought it might be the reason. I’d prefer to keep the sauce unstrained if the straining has nothing to do with preservation though. I followed the recipe to the letter. Now at the 7th day I see no signs of fermentation, but there is a high solid to liquid ration with this recipe so perhaps I should not expect to see too much bubbling? How do I know whether it has fermented? It smells great, looks good, no mold . . . but I am hesitant to start straining before I see some obvious confirmation that it has properly fermented. Advice? Does it smell and taste sour? I’m curious why there’s no need to keep the peppers or mash under a brine to prevent contamination like with sauerkraut or the fermented berries? I get an active ferment from the background yeast but you can always use the dregs from a bottle of lambic beer. These are lactic ferments from natural yeasts, try some gurrs as it’s fizzy through secondary ferment in the bottle. That you you enjoy the drinking part too! Will the brine from the jalapeno recipe work as a starter for the hot sauce? If so, how much should I use? I Made two batches with very rare Aleppo chilies: One was with ripe red and one was with green. 7 days now and no fermenting that I can see but also no mold. Used whey from on top of Greek Yogurt tubs! This recipe sounds so yummy! If one is allergic to dairy products, what is the next best culture starter besides whey that you would recommend? I tried this recipe using crimson red peppers which are both hot ans sweet. I made a gallon, and I very much regret not making more! I made this hot sauce, and the result is wonderful. I was concerned that there wasn’t enough liquid in the ferment, but the lactic flavor from the fermentation is good. Still, it was quite dry and I only got two cups of hot sauce. I assume that it is from the mix of peppers I used which were all thin walled except for a small amount of ancho and jalapenos. Could I have added water to this, and should that water have had a bit of salt in it to not dilute it? I assume that the fermentation requires a certain amount of salt in the brine to keep spoilage bacteria at bay. Can I use water kefir as a starter for this? I am vegan so no whey for me. Sorry, didn’t see previous comment before commenting. I found my answer, thanks. It sounds like it’s doing fine. Hi I placed roasted red chili with slices of garlic pink seasalt and Olive oil. Left for 3 days and found bubbles. Doesn’t smell bad. Is it safe to eat? Hi Tetros, it’s difficult for me to troubleshoot recipes I didn’t create. If you have a question about this recipe, I’d be happy to sneer it. Thank you Jenny, for your prompt reply. I wonder if it is safe to eat or has the chili gone? Thank you. I did the same long ago but did not find bubbles. May have put in ice box. Hi! I just made your hot sauce with lots of cayenne peppers and habanero peppers from our CSA. It has fermented for a week and I’m ready to put it in the fridge. I left it out on the counter to ferment in four jars while we were on vacation with cloth napkins tied over the top. It looks like it separated a bit. There is clear-ish liquid at the bottom. Is that ok or to be expected? Should I just shake it up and refrigerate? Hi Ashley, yep just shake it up or run it through a Hugh-powered blender. I tried making this with the masses of hot peppers that came in our CSA boxes this summer. I followed your recipe, and then put it into a large fermenting crock and then forgot about it long enough that the water in the rim of the crock was long gone. Unsurprisingly, the pepper paste inside was covered in white mold. So, I thoroughly scrubbed out the crock and tried again… making sure to keep the water topped up. It’s been bubbling away nicely, but six days into the fermentation, I took a peek and the entire surface is covered in white mold again. Is it possible that it’s going moldy because the crock is too large for the volume of peppers? When you use a crock, make sure it’s filled up to the neck of the crock (at least) otherwise it’s too much air and molding is more likely. I make kim chi with a bunch of chopped veggies which after fermentation last for months in the fridge. Why does your recipe for the fermented chili require disposal of the veggies to leave only sauce? Can the veggies be left in the sauce? Because it wouldn’t be a sauce if you left the solids in it, it would be hot pepper mash. This looks so good. I love when people use hot sauce and ferment it. It really gives it a great flavor! Thank you for sharing your recipe! Just a newbie question, can i use iodized salt? Yes, but it can leave a metallic flavor in your ferments. My friend made this and I’m hooked! I’m wondering if I can use plain kombucha vinegar for the fermentation part? 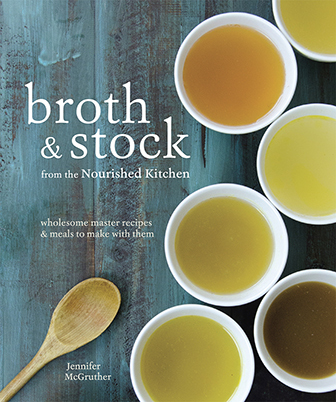 I came across The Nourished Kitchen on U Tube about 7 year’s ago, I am thrilled to find you again and looking forward to purchase you’re New Books, it is so nice to see that the Art Of Real Food’s is not lost. THANK YOU FOR YOUR INSPIREASHIONS. Can u use dried chilli?? If not could u rehydrate chillies in water then use ?? How many little hot sauce bottles does this recipe fill, please? Hi, was wondering if there is a way to adapt this for dried peppers? I wouldn’t recommend it, you’d have to completely rehydrate them and then brine them and I don’t think that the results would be right. You could, of course, try. I used whey from my husband’s homemade yogurt. How long should it take before I see evidence of bubbling/fermentation? Hi there. When I made Tabasco Sauce I first fermented all the chilies whole. Then I put it through the food processor and kept the seeds from the strainer till they dried out. I then put them through the food processor and made Chili Spice with them. Another time I just threw them into the garden to grow the next batch. Waste Not, Want Not. How much hot sauce does this recipe make? Seems like three lbs of peppers should yield, what, a quart of sauce? what can you use for a weight to keep the peppers from floating? Can I use frozen chilis? I already froze this years’s crop. Any clever uses for the pulp? I’d hate to toss it!